In the magnificently appointed City Hall of Norwich, the 49th annual meeting of the Central Council opened with pleasing dignity on Whit Tuesday. The 100 delegates stood as the Lord Mayor (Ald. S. A. Bailey), accompanied by the Lord Bishop of Norwich (Dr. Herbert), entered the hall, accompanied by the president (Mr. E. H. Lewis). Proceedings had been delayed for 10 minutes to enable the Press to take a photograph of popular appeal. The Bishop, the Lord Mayor and our President were snapped with the oldest ringer present, Mr. George Williams, aged 89, of North Stoneham, and the youngest, George Pipe, aged 11, of Grundisburgh, Suffolk. THE YOUNGEST AND THE OLDEST.- A happy picture from Norwich taken just previous to the Council meeting. 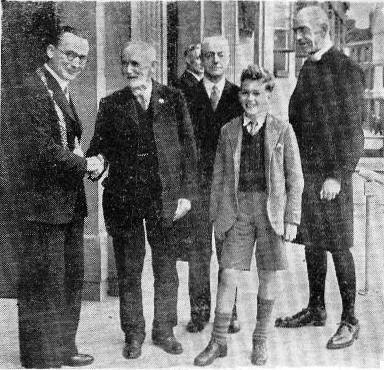 The Lord Mayor (Mr. S. A. Bailey), the Lord Bishop of Norwich (Dr. Herbert) and the President (Mr. E. H. Lewis) are ‘snapped’ with George Pipe, aged 11, of Grundisburgh, Suffolk, and Mr. George Williams, aged 89, of North Stoneham, Hants. The Lord Mayor, in his welcome, referred to this and said it was a long while since the Central Council came to the city. The year 1899 was the last occasion, at the beginning of the Boer War, and now they had come at the end of another war. The city had suffered terribly; they were in the front line and some of their ancient churches were completely destroyed. He thought it was fitting that an association like theirs should visit this city because Norwich from a bellringing reputation stood very high, and also for more than five centuries they had a thriving industry of bell founders. Bellringing had its attractions and gave joy to many people and also to those who indulged in that particular science, because when they found lads of 9 to 12 and elderly gentlemen up to 90 ringing together there must be something very fascinating. Personally he liked to listen to bells, but not too close as they were rather overwhelming. In Norwich Market Place they used to hold political meetings, and he remembered on one occasion trying to compete with his piping treble against the bells of St. Peter Mancroft. He had to close down and not the bells (laughter). The Bishop of Norwich in his welcome said bellringing was one of the things on which the world was divided between those who knew and those who did not know. While he had no practical knowledge of ringing, all his ministerial life he had been in close contact with ringers and bells. He supposed one reason why it was nearly 50 years since the Council last met in Norwich was because of the difficulties of travel. It was extraordinarily difficult to get to Norwich from any other part of the country except London, and that was more true in the days before railway travelling. East Anglia had for centuries a life of its own which accounted for many characteristics of its people. It was said that all through the Middle Ages there were 1,000 parish churches in Norfolk; it was said there were still 750 churches, the rest being in a state of ruin. Whether those figures were accurate he did not knew, but it was quite true there was a larger proportion of interesting and beautiful churches than anywhere else. The President, on behalf of the Council, thanked the Lord Mayor and the Bishop for their welcome. In both speeches of welcome, he said, there were one or two points in common. He might say how glad the Council was to come back to Norwich, as they looked upon the city as one of the great centres of the art of change ringing. ‘During the last year we, as ringers, have been particularly proud that we have been able to express the feelings of the nation in its joy on three special occasions which we have done in addition to our normal church work, but at the same time on these occasions we were expressing the feelings of the Church as well as our own in giving our share of thanksgiving to God for victory celebrations. Ye had round your necks what ye hold in your hands. Going back to the days in Norwich when bellringing was more of a sport than these days - they all knew that change ringing originated as a form of sport - but all that has been changed and to-day change ringing plays its part as a function of church work reminding people of religion and the Church. And in that connection it was very remarkable that, compared with the earlier days of the Council, that morning 40 members attended a celebration of the Holy Communion, where they prayed for the guidance and success of that meeting. That marks a very great change; we hope it will continue so that change ringers become 100 per cent. church workers, while retaining that spirit of competition which gives us most zest to our art. Canon G. F. Coleridge then said prayers. The Hon. Secretary (Mr. G. W. Fletcher) reported that the Council consisted of 52 affiliated societies entitled to a representation of 139 members, who, with 16 honorary members, made a total of 155. Of the 52 societies, 23 were entitled to four members each, 4 to three members, 10 to two members each, and 15 to one member. This was an increase of four in the associations affiliated. By the division of the area previously taken in by the Midland Counties Association they had three new associations, i.e., Leicester Diocesan Guild with four representatives; Southwell Diocesan Guild with one representative; Derby and District with one representative. The North Notts Association was again included on the roll. All affiliation fees had been paid. Ancient Society of College Youths: Mr. A. B. Peck. Bath and Wells Diocesan: Mr. S. G. Coles, Mr. J. T. Dyke, Mr. H. J. Sanger, Miss N. Williams. Bedfordshire Association: Mr. H. Harding, Mr. A. C. Sinfield. Coventry Diocesan: Mrs. D. E. Beamish, Mr. F. W. Perrens. Devon Guild: Mr. A. L. Bennett, Mr. F. C. Smale, Mr. W. C. Wakley. Durham and Newcastle: Mr. W. H. Barber. East Derbyshire and Notts: Mr. C. Evans. Ely Diocesan: Mr. C. W. Cook, Mr. F. Warrington. Essex Association: Mr. F. B. Lufkin, Miss H. G. Snowden. Gloucester and Bristol Diocesan: Mr. W. B. Kynaston, Mr. F. Waite. Guildford Diocesan: Mr. G. L. Grover, Mr. A. Harman, Mr. A. C. Hazelden, Mr. A. H. Pulling. Hertford County: Mr. W. Ayre, Mr. H. G. Cashmore. Kent County: Mr. E. A. Barnett, Mr. T. E. Sone. Ladies’ Guild: Mrs. G. W. Fletcher, Mrs. R. Richardson. Lancashire Association: Mr. P. Crook, Mr. G. R. Newton, Mr. W. H. Shuker, Mr. A. Tomlinson. Leicester Diocesan: Mr. A. Ballard, Mr. J. P. Fidler, Mr. H. J. Poole, Mr. A. E. Rowley. Lincoln Diocesan: Mr. J. Bray, Mr. Feirn, Mr. R. Richardson. Llandaff and Monmouth Diocesan: Mr. J. W. Jones, Mr. E. Stitch. London County Association: Mr. H. W. Rogers, Mrs. O. L. Rogers. Middlesex County: Mr. J. E. L. Cockey, Mr. G. W. Fletcher, Mr. T. J. Lock, Mr. W. G. Wilson. Norwich Diocesan: Mr. W. C. Duffield, Mr. F. N. Golden, the Rev. A. G. G. Thurlow. Oxford Diocesan: Mr. A. D. Barker, Canon G. F. Coleridge, Mr. R. A. Post. Oxford Society: Mr. W. F. Judge. Oxford University Society: Mr. J. E. Spice. Peterborough Diocesan: Mr. G. W. Jeffs, Mr. W. Rose. Salisbury Diocesan: The Rev. F. Ll. Edwards, Mr. G. Harding, Mr. W. C. West. Shropshire Association: Mr. G. L. Hewitt. Society of Royal Cumberland Youths: Mr. G. H. Cross, Mr. J. Parker, Mr. G. W. Steere. Southwell Diocesan: Mr. T. Groombridge, jun. Suffolk Guild: The Rev. H. Drake, Mr. C. W. Pipe, Mr. C. S. Sedgley. Surrey Association: Mr. F. E. Collins, Mr. D. Cooper. Sussex County: Mr. R. G. Blackman, Mr. F. H. Dallaway, Mr. F. I. Hairs, Mr. O. Sippetts. Swansea and Brecon Diocesan: Mr. A. Hoare. Truro Diocesan: The Rev. A. S. Roberts. Universities’ Association: Miss M. Cross. Winchester and Portsmouth Diocesan: The Rev. K. W. H. Felstead, Mr. G. Pullinger, Mr. G. Williams. Worcestershire and Districts Association: Mr. B. C. Ashford, Mr. S. T. Holt, Mr. J. D. Johnson. Yorkshire Association: Mr. P. J. Johnson, Canon C. C. Marshall, Mr. L. W. G. Morris, Mr. S. T. Palmer. Honorary members: Miss L. K. Bowling, Mr. C. Dean, Mr. T. Groombridge, sen., Mr. A. A. Hughes, Mr. C. F. Johnston, Mr. E. H. Lewis, Mr. J. F. Smallwood, Mr. J. A. Trollope, Mr. E. C. S. Turner, Mr. E. Alex. Young. Apologies were received from Mr. F. Colclough (Dudley and District), Mr. W. J. Davidson (Durham and Newcastle), the Rev. E. G. Benson and Mr. L. Evans (Hereford), Mr. F. E. Dukes (Irish), Miss E. Steel (Ladies’), Mr. J. A. Freeman (Lincoln), Mr. T. H. Taffender (London County), Mr. A. Thompson (North Staffordshire), the Rev. C. E. Wigg (Oxford University), Mr. H. Baxter and Mr. G. S. Valentine (Peterborough), Mr. A. Paddon Smith (St. Martin’s Guild), Mr. H. Knight and Mr. C. Wallater (Stafford Archdeaconry), Mr. F. W. Rogers (Winchester and Portsmouth), Mr. A. E. Lock (Oxford Diocesan), Mr. F. M. Mitchell (Kent County), Mr. C. W. Woolley (Hertford County), Mr. G. E. Debenham, Major J. H. B. Hesse, Mr. F. Sharpe, Mr. A. Walker, Capt. W. H. J. Hooton (hon. members). The following new members were presented to the President: The Rev. K. W. H. Felstead, C. W. Pipe, F. B. Lufkin, Miss L. K. Bowling, S. G. Coles, H. J. Sanger, A. L. Bennett, G. H. Harding, F. E. Collins, W. F. Judge, L. Hewitt, F. G. Waite, A. Hoare, C. Evans, A. C. Sinfield, H. Harding, W. C. Duffield, the Rev. A. S. Roberts, T. Groombridge, jun., Capt. H. W. Rogers, Mrs. O. Rogers, T. J. Lock, J. P. Fidler, A. Ballard, A. E. Rowley, J. Cotton. The Hon. Secretary reported a vacancy through the death of Mr. C. T. Coles. The Standing Committee decided to recommend the name of Mr. E. C. S. Turner. Mr. G. R. Newton proposed and Mr. P. Crook seconded that Mr. E. C. S. Turner be elected the second hon. auditor.- Agreed. The Hon. Secretary reported that there were four vacancies. The Rev. K. W. H. Felstead said there was a member who had come into their parts who was a member of the Council for many years, Mr. Charles Kippin. He proposed his election as an hon. member. Mr. G. Pullinger seconded.- Agreed. Mr. E. A. Barnett suggested as an act of courtesy the secretary of the New South Wales Association, Mr. W. M. Rowe, be elected an hon. member. He realised that Mr. Rowe could not attend meetings, but he thought it would be an encouragement to ringers in Australia if they were associated in that way. He moved, Mr. A. D. Barker seconded, and the Council agreed that Mr. W. M. Rowe be elected an honorary member. A silent tribute to the memory of the following members was paid by all members standing: Mr. C. L. Routledge, Mr. J. W. Parker, Mr. F. W. Romaine, Mr. C. T. Coles, Mr. E. W. Marsh, Mr. R. T. Hibbert, and Mr. J. T. Rickman. Mr. P. J. Johnson, in a tribute to Mr. Routledge, said his great work was better known in the North of England than in the other parts of the country. He occupied a unique position in the northern counties and they felt they had lost an honoured friend by his death. The Hon. Secretary reported that the minutes had been published in ‘The Ringing World,’ and the Standing Committee suggested, that they be taken as read. Mr. Turner proposed and the Rev. F. Ll. Edwards seconded that the minutes be passed as a correct record. The Hon. Secretary: According to my notes of the meeting, the first proposal was that it should appear on the front page, but some doubt was expressed as to whether it would be possible without seriously upsetting the wording. It was left to the discretion of the committee of ‘The Ringing World’ to find a convenient place. Mr. A. A. Hughes: I can confirm that. The minutes were then signed as a true record of the proceedings. The report of the Hon. Librarian (Capt. W. H. J. Hooton) was read by the hon. secretary, which stated that the sales of publications had been steady with a considerable increase in the demand for the Stedman and Grandsire sheets. The stock was very low and would be exhausted in a short time. Sales amounted to £27 11s. 9d. ; expenses 19s. 3d., postages £3 17s. 9d., and the balance paid to treasurer was £22 14s. 9d. Mr. Fletcher proposed and Mr. F. I. Hairs seconded the adoption of the report.- Carried. The Hon. Secretary reported that steps were now being taken to reprint certain sheets and they hoped that by the next meeting these low stocks would be replaced. A lot depended on how much paper was available. Mr. J. F. Fidler asked if the book on the care of bells and belfries would be brought up to date. The Chairman: I would be glad to see the Bells and Belfries Committee go through that book. Mr. Fidler: From what I remember of it it was a little out of date. The Chairman: I will bear that in mind. To balance, Whitsun, 1945, £258 11s. 4d., affiliation fees, arrears, 1944-45, £8 10s. ; affiliation fees, 1945-46, £34 5s. ; subscriptions, hon. members, £2 1s. ; sale of publications, balance £22 14s. 9d. ; total £326 2s. 1d. By expenses: Library insurance, 12s. 6d. ; grant to Tyrwhitt-Drake memorial, £3 3s. ; life subscription, Noise Abatement League, £5 5s. ; wreaths, £2 10s. ; stationery and printing, £3 19s. ; telephone and postage, £6 2s. 8d. ; expenses, 1945 meeting, £1; balance, Whitsun, 1946, £303 9s. 11d. ; total £326 2s. 1d. Mr. Fletcher proposed and Mr. Newton seconded that the accounts be adopted, subject to audit.- Agreed. On matters arising, the Hon. Secretary said in 1938 a book on Surprise methods was being prepared. They were now in the happy position of being able to repay to associations £6 4s. 3d. paid in advance for copies. He proposed and Mr. L. W. G. Morris seconded that this sum be returned.- Agreed. Mr. E. A. Young, as a trustee, reported that Mr. Hughes and himself were keeping a close watch on the machine. It had been brought back from the Welsh mountains to the Victoria and Albert Museum. It had not been unpacked, but it was hoped that it would be in October or November. At the present time they had only one of the two demonstrators; they had no one to replace the late Mr. Driver. He proposed and Mr. P. J. Johnson seconded the adoption of the report.- Agreed. The report of the Standing Committee was formally presented by Mr. Fletcher and adopted. Mr. H. G. Cashmore presented the report of the Peal Collection Committee, which stated that with the co-operation of Mr. C. W. Woolley they had undertaken the revision of the compositions submitted to the 1939 meeting. Certain sections were not up to date, particularly that devoted to Spliced Surprise. They did not consider that the present collection was ready for publication. He proposed the adoption. Mr. Newton, in seconding, expressed the gratitude of the Council to Mr. Cashmore for the work he had done. Mr. E. C. S. Turner said he had the collection of Surprise methods and it should be ready for printing. It contained 239 Surprise methods and certain other material of interest. In reply to a question as to whether the book would contain all the Major methods known, Mr. Trollope replied in the negative and said that some were not worth ringing. It was a book designed and prepared for the sake of practical ringing of the future. Mr. Turner said that only the best were included. Mr. F. N. Golden: Is there any proposal to extend these Surprise methods to Royal or Maximus? The reason why Cambridge is so popular is because it can be extended. Mr. H. J. Poole: Is anything to be done to make the Royal methods available for those who wish for them? Mr. Turner: If there is a sufficient demand I have no doubt that the committee will produce such a book. Mr. C. Dean presented the report, which stated that 1,304 peals were rung during the year, including 178 on handbells. The report would be published in ‘The Ringing World’ as soon as room could be found for it. Mr. R. Richardson seconded and the report was adopted. Mr. Dean said the secretary had received a letter from Mr. F. W. Rogers, hon. secretary of the Winchester and Portsmouth Guild, asking for the peal of Grandsire Caters rung on February 16th, 1946, without a cover bell to be recognised as a peal by his Guild. It should be noted, stated the letter, that it was rung in a tower with nine bells only. The Chairman: In the rules and decisions of the Council it says in regard to 9 and 11 bell peals that there be not less than 5,000 true changes rung without interval, in each case with the addition of a cover bell. This decision was come to in 1892 and in 1925. I think that gives you your instruction. Mr. Dean moved and Mr. W. Ayre seconded that the secretary reply accordingly. The Rev. K. W. H. Felstead thought the matter raised was of a much bigger issue. It was very obvious that the rule quoted did not imagine that there would ever be a tower of nine bells in the chromatic scale where such a performance could be carried out. As there were only nine bells and 5,000 true changes were rung without interval, it seemed to him that this peal ought to be recognised. If Doubles and Triples were recognised, why not other odd bell methods? He moved as an amendment that the peal be recognised. Mr. A. A. Hughes denied that the bells were in a chromatic scale. These bells were put in in two peals - the top eight for ringing on sad occasions and the bottom eight for ordinary ringing. Mr. G. Pullinger seconded the amendment. He was sorry that the peal was not rung by some other society than theirs. The band with two exceptions were members of the College Youths. He wished it was rung for them. Mr. A. H. Pulling: I think there is too much fuss about this. I have heard seven bells rung and it is an awful row … This was rung as a stunt and a practical joke, and we ought to abide by the rule. Mr. Pullinger: Why should 9 and 11 have to have a cover bell when 7 and 5 can be rung without? The Chairman: As regards seven bells, ‘a performance on seven bells without the addition of a cover bell is to be discountenanced.’ On the question of five they form a very fine musical peal. There were six votes for the amendment and the resolution was carried. The Secretary said the Standing Committee felt that the present Rules and Decisions were not up to date, and they undertook to bring them up to date and submit them to the Council at the next meeting. A resolution to this effect was moved by Mr. Fletcher and seconded by Mr. F. I. Hairs and carried. Mrs. Fletcher stated that no peals in new methods or progressive lengths had been reported to the committee in 1945. The work of typing was progressing and they hoped to show them what the final book would be like, but owing to difficulties in binding they had not been able to do so. In the event of new methods rung this year it would greatly help the committee if the conductor would send the composition direct to the secretary of the Council. Mr. P. J. Johnson seconded and the report was adopted. The conference then adjourned for lunch. The Rev. Ll. Edwards said he had an inquiry on the same point as regarded lightning conductors.- The report was adopted. Such references to bells and bellringing as have been observed in the Press by members of the committee have almost all been of a favourable nature, and appear to indicate that the subject appeals to popular sentiment and is regarded by editors and press correspondents as making ‘good copy.’ To judge by reports in the London and provincial Press, the pealing of church bells last August to celebrate the end of the most terrible war in human history was hailed with universal joy as the recognised expression of national feeling. Numerous paragraphs on bells and ringing have appeared from time to time, and have been for the most part well informed. A notable instance was an article in the ‘Manchester Guardian,’ the writer of which told the story of a friend becoming a ringer. The ‘West Briton’ published an admirable photograph of the veteran Cornish ringer, Mr. Sam Quintrell, on his ninetieth birthday, standing in the belfry with a young ringer of 15. Another journal stated that Nolan Edwards, who at the age of six rings at Shepshed, is believed to be the youngest bellringer in Britain. A Midland newspaper records the revival of the curfew at Maidwell, Northants, after a lapse of 140 years, as well as its suspension at Shaftesbury through failure to find anyone to undertake the duty. Obituary notices of members of the Central Council in the provincial Press have included carefully compiled accounts of their ringing activities. Another subject commanding considerable attention in daily and weekly publications has been the measures taken to collect and restore to continental churches bells looted during the war. A welcome announcement in the London papers stated that the church bells of Moscow were rung at Easter for the first time in 20 years. It remains to say that ‘The Ringing World’ continues to flourish and the inevitably restricted supply of copies is insufficient to meet the demand. With regard to broadcasting, ringers distinctly occupied pride of place last summer, when a message broadcast by Government authority recommended the celebration of victory over Japan with ‘bells, bands and bonfires.’ Actual broadcasts of bells have been chiefly as an introduction to religious services. The B.B.C. state frankly that they use the bells only as a background, but this practice is very often carried beyond reasonable limits, and the bells no sooner become audible than the voice of a parson or layman breaks in and the bells are faded almost into silence. A typical instance recently occurred when St. Mary Redcliffe bells were put on the air, and within 30 seconds a stentorian voice rendered them almost inaudible with the ironical remark, ‘I hope that you can hear the bells ringing out over the city’! When ringers take the trouble to exert their best efforts for the purpose of broadcasting, it is only reasonable to ask that they should be allowed three minutes of uninterrupted ringing, at the end of which the bells could be brought into rounds and then faded into the background, while introductory statements are made. It is satisfactory to be able to report that in most cases of broadcast ringing the striking has been quite good. That is, which we have happened to hear. Another criticism to make is that broadcasting of bells is too haphazard. There have been quite a number of such broadcasts in recent weeks, but there was none at all on Easter Day, though at Christmas the bells of several churches were to be heard. We may end our report with one cause for gratification. The B.B.C. are preparing a broadcast on change ringing for the benefit of young people, and a lady in charge of this feature has actually asked advice of the Central Council! (Signed) F. Ll. Edwards, A. Paddon Smith, Albert Walker. Mr. J. Spice, in seconding the adoption, said one broadcast on bells was given by the niece of the president. Miss Monica Richardson, with the assistance of the University and Bristol bellringers. Mr. Tom Groombridge, jun., said Miss Monica Richardson gave a good broadcast. The Rev. A. G. G. Thurlow said a short time ago the Rev. W. Martin Wilson, religious broadcasting assistant, Midland Region, wrote that he was very anxious that there should be peace between the B.B.C. and the bellringers broadcasting, and asked for his views. Mr. Thurlow said he would be very grateful if members of the committee would tell him how to answer the letter. Mr. P. J. Johnson thought the Broadcasting Committee might give their earnest consideration to the matter and, if time allowed, the President in conjunction with Mr. Thurlow should frame a reply. What they had to realise was that the people at the Broadcasting Corporation, with the best will in the world, knew very little about bells, and it was important that the broadcast coming over should serve them best from a propaganda point of view. It would now seem possible for us to resume the task laid on as by the Council - that is to compile a record of all peal records contained on tablets and boards in the church towers of the country and of dates up to 1825. In 1939 the Council agreed our proposal that we should appoint ‘district representatives,’ to be associated with the committee, in order to obtain details of old peal boards in particular localities. In our last report, that for 1940, we stated, that we did not propose at that time to operate the scheme, as it would not, in the conditions then prevailing, have a fair chance of success. We consider that we can now ask members of the Exercise in general and of the Council in particular to help us to bring our work to completion. We shall, therefore, be glad to receive offers of help from any person who is willing to be associated with our committee in obtaining details of old peal boards in his part of the country. The details we require are full particulars of the type of tablet or board, its condition and the exact wording thereon. (Signed) Wilfrid G. Wilson (convener), Walter Ayre, C. Elliot Wigg. The Rev. F. Ll. Edwards asked how far back before a board was considered old. Mr. Wilson: Anything before 1825. Mr. N. Golden: How many peal boards have been recorded? Mr. Wilson: In 1939 we reported that we had so far received details of 177 boards recording 283 performances in 83 towers. I think there may be anything up to 500 boards in the country. About two-thirds we have. We desire a note on the condition of the board. When we have finished our work these will be kept in the Council’s records. Mr. A. C. Hazelden said it would be recalled that last year at the Birmingham meeting, as the result of the war and the death of two active members of the committee, he found himself with the legacy of the papers those two people (Mr. J. S. Goldsmith and Mr. W. A. Cave) had collected. They had proceeded with the collection of information. Every week ‘The Ringing World’ contained some vital information and they had made plans to codify that information. Furthermore, plans for more permanent records were being considered. He would like to acknowledge the help given by a gentleman outside the Council, Mr. Viggers, of Aldershot, who was an expert in this matter and his advice they were going to act upon. He appealed to people to give them information when circularised. Mrs. Fletcher seconded and the report was adopted. The Hon. Secretary said at the last meeting at Birmingham, under any other business, Mr. C. T. Coles gave notice of a proposed alteration of rules. Unfortunately by his death they had no formal notice before the Council. They might consider before the next triennial session whether any alteration of rules was necessary. The first was in determining the membership of the Council. At the present time they had 75 members to make an association eligible for one member and 150 for two. Now it had been found in the last two years that association records were very incomplete. Some did not know whether they were entitled to three or four members. Should non-resident life members be taken into consideration? The second point was whether membership for representation should be considered annually or at the beginning of a triennial period. The next point was in regard to honorary members. At present an honorary member on election took his seat at the end of the meeting. In his own personal case he moved away from Middlesex and took up his abode in Norfolk. At the moment he represented the Middlesex Association. If he resigned from the Middlesex Association and the Norwich Diocesan Guild did not want him, then the only way, if the Council still required his services, was to appoint him an honorary member. At the first meeting of the transfer the agenda would have to be the election of president and then the election of honorary members. He asked members to consider the points raised. Mr. Charles J. Sedgley moved that in future all publications issued by the Central Council have the compositions printed correctly, i.e., with the notation in front of the resulting course end. He said he brought the motion forward for the sake of clarity and accuracy. It should be their endeavour to have everything connected with the Exercise as clear and as accurate as possible, and it could not be said in setting out their compositions in the way they did that they were clear. They could not have a course end before they had a call. It would be all right if they read from right to left. but as most people read from left to right it seemed obvious that notations should be in front of the resulting course end. Mr. F. Nolan Golden, seconding, said the only opposition could be on the bond of tradition, but that tradition had already been broken. Mr. H. Cashmore said he would support the motion if there was any evidence of confusion by this system of notation, but at the present time he had not seen any. He suggested that there would be greater confusion by the two systems running side by side than at present. He did not agree with the suggestion of Mr. Sedgley that his proposed system was correct. Mr. J. A. Trollope considered the Council could not pass the motion as it stood for the reason that the question of copyright came in. At the present time ‘The Ringing World’ was publishing a series of articles on Double Norwich Caters by Mr. Shepherd. ‘The Ringing World’ published them, but the copyright belonged to Mr. Shepherd, and he could put in the notation as he desired. They could not lay down the rule that a book must be in some form unless they were prepared to decline to publish some work of value to the Exercise. Mr. E. C. S. Turner pointed out that the Peal Committee had done a lot of work, and it would have to be scrapped. Mr. H. J. Poole urged the Council. not to waste more time on the matter. The motion was then put and defeated, only seven members voting for it. The Hon. Secretary presented the accounts of ‘The Ringing World’ for the year ending September 3rd, 1945. He said the income for the year was £1,743 13s. 8d., expenditure was £1,395 12s. 2d. and the net profit £348 1s. 6d. Assets amounted to £1,611 3s. 9d., made up of goodwill £200, debtors £260 16s. 5d., and cash £1,150 7s. 4d. Liabilities total £564 8s. 10d., being loan from general funds of the Council £200, creditors £137 8s. 8d., payment in advance £227 0s. 2d. The balance on capital account was £1,046 14s. 11d. The accounts were subject to audit. He moved their adoption. Mr. F. W. Perrens seconded and suggested that each association should have a copy of the accounts. The accounts were adopted, subject to audit, and Mr. Perrens suggestion adopted. THANKS TO MR. AND MRS. G. W. FLETCHER. Canon C. C. Marshall said he felt that, having received that very happy report on the position of ‘The Ringing World,’ members of the Council would not want to let that presentation go by without saying something. He felt that they owed a tremendous debt of gratitude to Mr. and Mrs. Fletcher for all the work they had done to bring this happy work to this end. There were very few people who knew of the vast amount of work in bringing order out of chaos and rescuing from shipwreck something which they hoped would go on its voyage for many years. To that end a very great deal of hard and self-sacrificing work had been done by Mr. and Mrs. Fletcher. He was quite certain that Mr. and Mrs. Fletcher had no thought of reward for the work they had done. It had been done for the sake of the art they loved so much. He thought something more was due to them. ‘The Ringing World’ had been put on its feet and was ready to go forward. It had this balance in hand and they felt that to a very great extent was due to the self-sacrifice and assiduous work put into it by Mr. and Mrs. Fletcher. He moved that out of the funds of ‘The Ringing World’ they made a grant of, say, £200 to Mr. and Mrs. Fletcher as a token of their appreciation for all they had done and at the same time express to them their most grateful thanks for the work that had been achieved. Mr. George Williams said as an old member and friend he would like to heartily support the resolution. The motion was carried amid applause. Mr. George Fletcher: You really must spare my blushes. You have said a lot of flattering things. You have to go back to when we stood at the graveside of J. S. Goldsmith. Some went away, some stayed and that marked the turning point in the fortunes of this paper, because when we stayed we had to face difficulties and give personal undertakings so that the executors would not suffer. From what we could find out at that time the paper was making a big loss. So far as my work and that of my wife’s was concerned, it was purely a matter of accounts. I want you to remember that because there are other sides connected with the paper. We were fortunate. We weathered the storm and we have now some little nest egg to see us through the difficulties ahead. That does not mean that the money you have in hand should be squandered in the way you suggested to-day. We did not work so that we should gain. Without being ungrateful I want to have the liberty of considering how the money can be applied, not for my personal benefit or my wife’s, but for the work we have at heart. I thank you for your generosity. I look upon it as a personal gift. I come and ask you to do a personal thing for me, then I shall expect you to do it as you have done for me to-day. The Chairman: Mr. Fletcher would be the last to claim any credit for the work on the editorial side. I want to keep those two sides apart. That for some time past the contents of ‘The Ringing World’ have not been conducive to the fostering of our art, especially among the younger generation of ringers. In their interest it is suggested that more space be made available for current affairs by the exclusion of irrelevant matter, by printing the leader in smaller type; also the notice of officials of the paper could be condensed or only inserted in alternative weeks. Mr. George W. Steere: I rise to propose this resolution because there has been quite a lot of dissatisfaction in the manner certain things are published in ‘The Ringing World,’ especially as regards young ringers. They never have their names in the newspaper as they used to and like they ought. They have been treated rather roughly; they should be encouraged. We have heard a lot that space his something to do with it, but it may be overcome by setting some of the articles in smaller type. Another point is that reports of meetings have been seriously curtailed and in some cases ignored altogether, and certain other things have never been included. I have a copy of something South-West Essex people circulated to all their members concerning the Crusaders. A request was made that it should be published in its entirety in the paper. It was sent back as not being of the appropriate style. The Editor thought it should be treated differently, which did not set out the things the Crusaders intended to do. Mr. G. H. Cross, seconding, said when he was young if he rang a peal he liked to see it in print. In these days quite youngsters ring Surprise methods. Mr. H. J. Poole supported the motion, but before he did so he wanted to recall that at the last meeting there was an instruction that all complaints should be addressed to the secretary of the committee. How many complaints had been received and what steps had been taken to deal with them. The Chairman: A certain number of verbal complaints and a certain number of written complaints have been received by the secretary, and he has endeavoured to take steps to obviate them if they were serious ones. Mr. E. A. Young: There are two sides to every question and I have met a number of people who say how much they enjoy ‘The Ringing World.’ I would like to ask if there has been commendation of what has appeared in ‘The Ringing World’ generally. Of course, like all these papers they endeavour to cover as wide a field as possible, and while we have things in common we have our little differences, but taking it altogether we feel there are other sides. I get a great deal of delight in reading ‘The Ringing World’ from beginning to end. Mr. A. H. Pulling: I like enjoying certain things, but that is not the point. No editor has the right to put his personal views above the opinion of this Council. I think the Council will agree that for a boy of 10 years to ring a peal of Cambridge is worthy of notice, and ‘The Ringing World’ is our paper. Some weeks ago peals in ‘The Ringing World’ had two names the same. I said to my wife, ‘I never knew So and So had a brother. I wonder where he dug him up.’ Two nights later, after looking through an evening paper, she said, ‘Have you seen this from Suffolk? A boy of 10 ringing a peal.’ I have a great objection to having to pay 3d. for a dear little paper and then to look in ‘The Evening News’ to find news which ought to be in our paper. I was also told that so and so had a son who rang Surprise and he came down to our tower. That boy had rung a peal of London and Spliced. I feel that boys and girls of that age deserve encouraging. You put in first peals. Why not put in aged 11 or 12. There is no waste of paper. I do think the Editor should leave his personal fads outside the paper. Mr. J. P. Fidler: As I go about the country there is one thing of which I hear verbal complaints, and it is why don’t they put footnotes in? The chief complaint is footnotes to peals. Mr. J. E. Spice: There are footnotes and footnotes. In the olden days there were silly footnotes. I rang in a peal of Spliced Surprise. For one member it was first peal of Surprise, two others’ first peal of Spliced Surprise. I sent up the peal. I put an asterisk for the first peal of Surprise and a dagger for the first peal of Spliced Surprise. That dagger was eliminated. Another point is the weight of a tenor. A friend of mine had the weight of the tenor 16 cwt. omitted. I can see no reason. I should like to see Belfry Gossip revived. On the question of space, why could not an article like ‘Ringer in the Cotswolds’ be put in smaller type? Mr. F. I. Hairs: The reports of meetings in ‘The Ringing World’ lately have been nothing less than a repetition of the official notices. From my experience of the printing trade, which is only 40 years, I know that articles need sub-editing, but it does not mean treating them like that. Mr. A. D. Barker complained that the odd quarters and lbs. had been deleted from the weights of tenors. He was persuaded to send in a report to ‘The Ringing World.’ He wrote it, but got a much better report in his local paper. Mr. H. J. Poole said he would like to support the resolution, but he did not want to cast any reflection on anyone. He was not too convinced as to the reply he got to his question concerning complaints. They had been side-stepping the motion that was intended to deal with younger ringers. The first thing was that the necessity did exist for the resolution; nobody denied it. If they did not support young people the time would come when they would not need ‘The Ringing World.’ It was for the young generation to carry the load and they should give them every encouragement. From the point of view of ringing they were being encouraged, but they did need this encouragement which they were not getting through the Press. It did mean something to these young people to see their names and footnotes and ages. They were told to-day that they ought to encourage competition. How were they to encourage it if they did not let one part of the country know what the other was doing? There was one time an old school who had no room for youngsters. The time was when youngsters could sit in a belfry and never be asked to ring. That time they hoped was gone. He did not want to under-estimate the efforts of the Editor of ‘The Ringing World’; but for his efforts there would be no paper, but there was no reason why he should not do as the majority of the members wished him to do. On the front of the paper they had that it was the official journal of the Central Council. While they should give him latitude, the policy of ‘The Ringing World’ was not a matter for the Editor, but for the Council. The policy of ‘The Ringing World’ should be governed by the Council and not by the Editor. The Rev. H. Drake: I do not think this motion is the right way. It seems to me to be a slur on the Editor of ‘The Ringing World,’ Most of the things that have been said against the Editor have been owing to the fact that there was not enough paper. What they all agreed about was that there were not enough footnotes to peals. Mr. E. Stitch endorsed what Mr. Poole had said. From ‘The Ringing World’ they learnt what their fellow ringers were doing in other parts of the country. Mr. W. C. Duffield thought it would he unfortunate if the motion went through after the wonderful work of the Editor in the past four years. He had a great sympathy with those speakers who advocated a larger number of footnotes and that the younger members should come forward and do their stuff. He could claim no share in advanced ringing, but he had brought forward 38 youngsters to ring their first 720, and it had given them immense pleasure to read these footnotes. Another member thought that the article on Double Norwich should be in smaller type. Mr. H. J. Poole moved as an amendment that the policy of ‘The Ringing World’ be decided by the Council. Mr. F. I. Hairs seconded the amendment, remarking that he always understood that the proprietor decided the policy of the paper and the editor carried it out. Mr. G. L. Grover said he held no brief for the Editor of ‘The Ringing World.’ On one occasion he challenged the Editor’s personal views, but the Editor wrote him a four page reply and he felt crushed. Since then he had not tried to get his own views published because he happened to come from Guildford. Having regard to the many years of devoted labour that Mr. Trollope has put in for ‘The Ringing World,’ a great part of which was not adequately remunerated, he asked the Council not to pass this motion, which amounted to a vote of censure. It would be ungrateful to Mr. Trollope to pass the motion. Mr. H. J. Poole asked for the amount of remuneration paid to Mr. Trollope. Mr. Trollope: You are at liberty to state what I had from the beginning of the war. Mr. Fletcher: If we go back some 10 years you will remember that a fund, which was known as the J.A.T. Fund, was formed. Mr. Goldsmith had the administration of that fund and you will remember that during Mr. Goldsmith’s illness Mr. Trollope acted as editor. Mr. Trollope’s salary came from that fund. The balance was passed on to Mr. Rupert Richardson and the fund was wound up when we purchased the goodwill. The question of Mr. Trollope’s salary has been raised. We had great trouble in persuading him to take anything and at last we succeeded in his agreeing to three guineas per week, plus expenses. That obtained until March, 1945. As from April 1st, 1945, he had been paid five guineas a week, plus one guinea expenses. Mr. P. J. Johnson suggested that the mover and seconder of the resolution should withdraw and have the single amendment before the meeting. He felt that some of the things said of the Editor were ill-deserved. They had to realise that during the momentous days of the war, when it was impossible to get copy for ‘The Ringing World,’ his historical articles kept the paper going. Any man with a strong personality was bound to get up against people. Mr. E. C. S. Turner: There is one point I would like to make. I started ringing peals as a youngster. If I was held up in ‘The Ringing World’ as a prodigy I would have thrown it in the fire. Mr. J. A. Trollope: I strongly object to the withdrawal of what is a vote of censure. I stand or fall by a direct vote and not by any substitute. I did not intend to speak. You must bear with me because I am suffering from heart trouble, which makes it difficult to speak. I have an answer to every single point that has been brought up in this discussion. My one real answer is ‘The Ringing World’ itself. I can say this. I never used the paper to air my fads. I have run that paper with the single idea of my duty to myself and the Exercise so that when I die people can say I did the job well. Now the question of ages arose several years ago and it began to look as though they would flood the paper. I gave it a lot of consideration. I had no opinion; I consulted responsible people in this Council, men here now. I tried to find out what was the opinion of ringers generally on the subject. I came to the conclusion that it was not for the good of ‘The Ringing World’ or the Exercise or the young people that those ages should be published. Having made that resolution there was only one way, that was to apply it impartially, and that is what I have done. I still think it is the thing to do. What you cannot discuss in public is to ask yourselves how much this urge of young people is due to the vanity of parents and teachers? If you were to publish these ages the result would be that you would have in this paper every week a dozen or a couple of dozen. The whole thing would be common and the average ringer would get fed up with the kids all over the place. I have no objection to young ringers. Perhaps the biggest blessing I have had was with two schoolboy ringers, and the friendship I formed then I have to-day. If I were to take up some boy and boost him, what would be the result? Jealousy and ill-feeling. This resolution comes from the Society of Cumberlands ‘The Ringing World’ has done more for young ringers in three years than the Cumberlands have done in 200 years. Mr. G. H. Cross: As the seconder of this resolution I have said nothing about the Editor. I think what we have put forward has nothing to do with Mr. Trollope personally. Mr. Walter Ayre: There is no personal reflection on Mr. Trollope. Every member I have spoken to has said what a good spot of work Jim Trollope had done. Mr. R. G. Blackman: I feel from what has been said with regard to the passing of this motion will be rather badly misunderstood if it should go through as it is. Like all those who have spoken this afternoon, I am most keen on the youngsters coming along and also on the future success of ‘The Ringing World.’ Regarding setting the leader in smaller type, I know of no journal of repute that sets its leader in small type. With regard to the amendment, how are we to run the paper? Are we to meet every week? No, it must be left to the Editor. No journalist of repute would expect it to be successful if it is run by 50, 60 or 100 different people. I do not believe you will make a really good ringer of any child if you bring him up to believe that every time he does something out of the ordinary his name has to be published in the paper. I do not think it will improve ‘The Ringing World.’ I believe if the motion is withdrawn a good deal of good will come of it, and the present committee, with Mr. Trollope, will give, as they have in the past, every consideration to what has been said. Mr. Trollope: I will not accept anything but a direct vote. It is a vote of censure. Mr. G. W. Steere: This motion was not brought forward as a motion of censure. It was brought by our society to voice the dissatisfaction of our society. Mr. H. J. Poole said his amendment was that the policy of the paper be determined by the Council and carried into effect by the committee. Mr. Trollope: I say the resolution or the amendment must he regarded as a vote of censure. Mr. Blackman: You have not got in your amendment what is the policy. Mr. C. Dean: I move the previous question. The Rev. H. Drake: I second. Mr. Turner: I think it would only be fair to warn you that it will result in the resignation of the Editor. Mr. Poole: It is not a question of pointing a pistol at the head of Mr. Trollope. The motion to pass on to the next business was then put and carried by 42 votes to 34. Mr. Trollope: As the Council has refused my request, I have no other option. ‘The Ringing World.’ will appear next Friday and after that my connection with it ceases. The Hon. Secretary reported that an invitation had been received to hold the next Council meeting at Exeter. The Standing Committee recommended that it be accepted. The Council was last there in 1907. Mr. F. C. Smale: On behalf of the Guild of Devonshire Ringers, we would give our Central Council a most hearty welcome. Mr. R. Richardson seconded that the 1947 meeting be held at Exeter. Canon G. F. Coleridge proposed a hearty vote of thanks to the President for the admirable manner he had conducted the proceedings.- This was seconded and carried with acclamation. Mr. W. Ayre proposed a hearty vote of thanks to the Lord Mayor of Norwich for the use of the Council Chamber, the Bishop of the Diocese for his attendance, the various incumbents for the use of the bells, to Mr. Nolan Golden and his committee, and to the Rev. A. G. G. Thurlow for acting as guide. Mr. G. Pullinger seconded and Mr. John Spice supported the motion. The votes of thanks were acknowledged by the President and Mr. Thurlow. The Council was then entertained to tea by the Norwich Diocesan Association at Davey Place Restaurant.